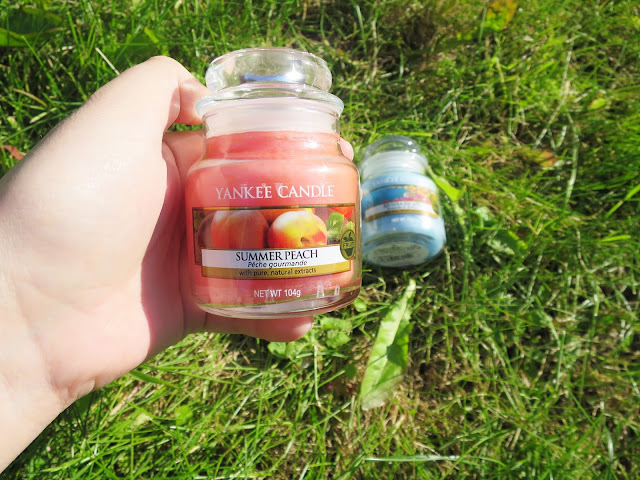 If you've read my blog for quite a long time you'll be aware that I am a huge Yankee Candle fan and it would seem you guys are too, whenever I post a picture a new candle or the latest collection it gets a lot of likes/views. 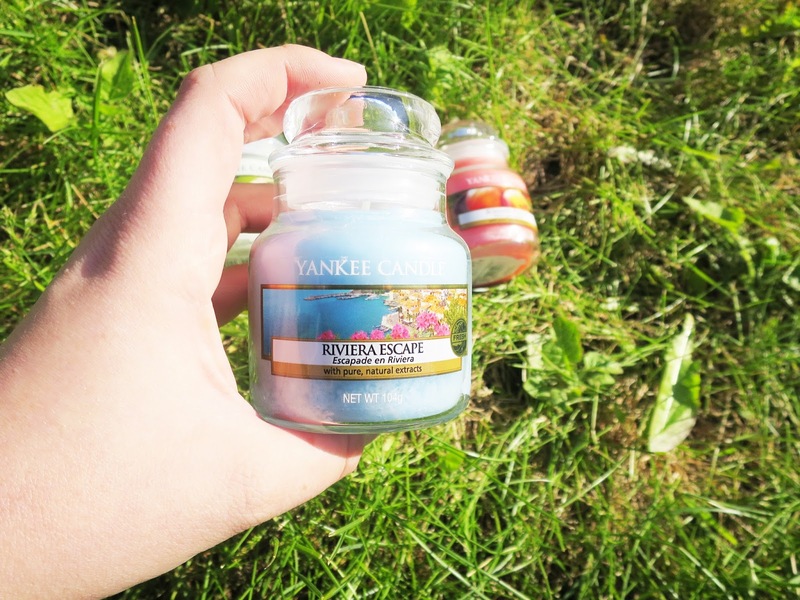 So today I am bringing you the latest collection from Yankee Candle which is called the Riviera Escape and it features four beautifully scented and lovely coloured candles. 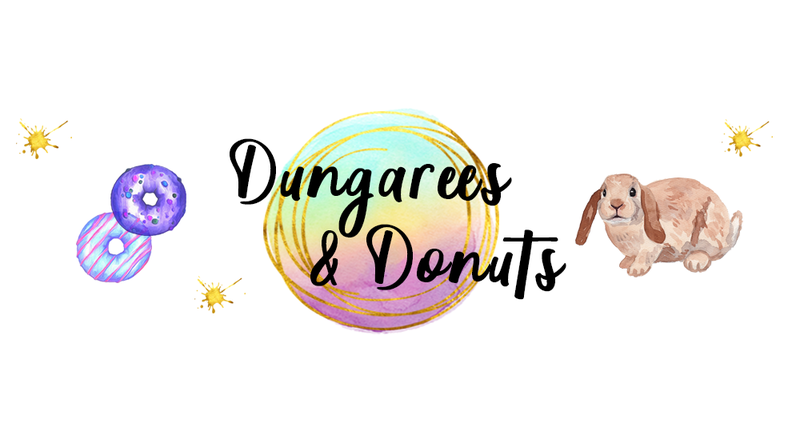 If you want to read any of my previous Yankee Candle reviews here is the place you need to look. Let me know which your favourite scent is if you've tried any of them, I'd love to know your opinions too! The first thing which I find fabulous about this range is the lovely contrasting colours of the summer collection, with the baby blue, peach, lime green and finally white they go together really well. I do have to say I've been burning Summer Peach and Riviera Escape together for the last few days and they go together really well also. I found this to be one of my favourites out of the bunch, it's a sweet fragrance which what I would usually go for, and I wanted to light this one first because of the colour and the name. Yankee Candle refers to this candle as "Ripe peaches straight from the orchard, warmed by the sun and begging for that first juicy bite" I agree with this as it totally smells like peaches and is yummy enough to eat (Yano, if it wasn't a candle...) The only thing I would add is the fact it doesn't smell really strong like peaches only a mild scent and I love the idea of strong fragrances. When I first lit this candle I was very unsure of it and to be honest I am still not in love with it, it's something I would have burning in my house but it doesn't give me the usual pleasure Yankee Candles usually give me. It's stronger than the peach candle which is a plus but it's not my cup of tea, it does remind me of being outside and playing near some flowers. 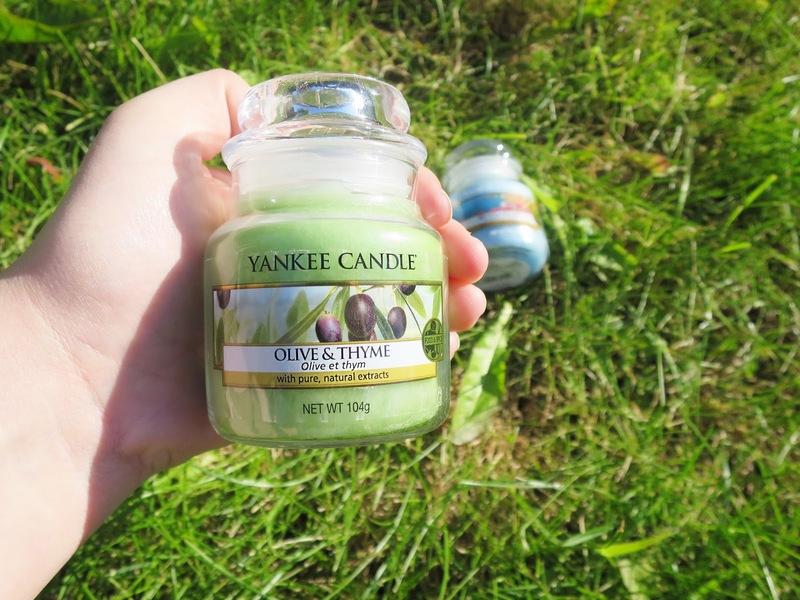 Yankee Candle says: "A fresh, herbal scent from the Mediterranean coast with olive leaf, citrus and musk" I do have to say the more I smell it, it does remind me of herbs and a lot of citrus, but still not a huge fan! When I first read about this scent I guess I was hoping it smelt like that fresh smell you get on a beach when the tide is going out. This to me is the most summer smelling one based on the name, although it doesn't actually smell like that, it smells like something better. I am honestly so in love with the strong smell of this candle, it's crisp, it's strong and it smells divine to me! It has an ever so small tone of salt running through the candle but that's what makes it even more beautiful. 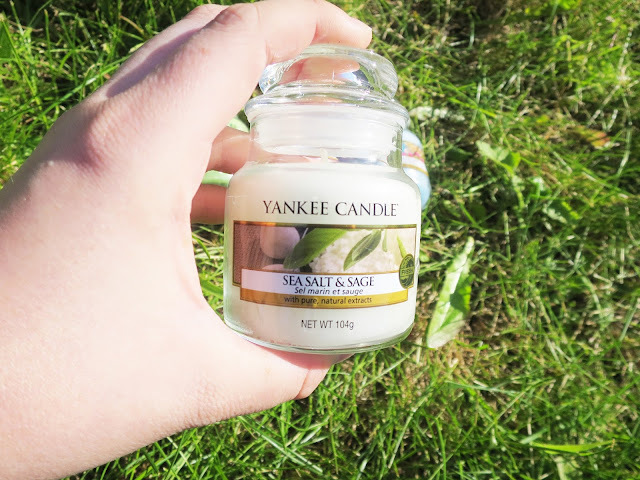 Yankee Candle state that the candle is: "Warm and inviting sage mingles with the clean, fresh scent of sea salt…like a relaxing walk along the shore" I would 100% agree with them on this, totally a fresh and clean scent. This is the candle I expected the most from as it's what the range is named after and I wasn't disappointed, the smell of this is a perfect background scent for any room! With the summer smell present in this candle it totally ties the collection together. The beauty which comes with this candle makes me feel so happy and smells like fresh flowers on a summers day. Yankee Candle say: "A coastal scent of glittering promenades, full with hillsides of beautiful blossoms glowing in the sun". 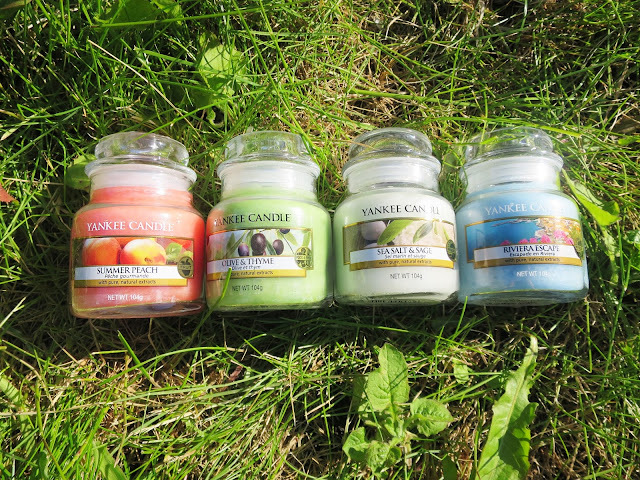 For any candle lover it's a totally worthwhile collection and perfect for those summer tones! I love the sound of the sea salt and sage one I'll have to give it a try. Great post lovely! Oh how lovely - I think the peach or the sea salt and sage would be my favourites. The sea salt and sage sounds wonderful! I'm into clean scents and that seems it would be. They all sounds great but the summer peach has to be my favourite. Reading these I defo think Summer Peach would be my favourite. I quite like the sound of it being Mild to.